Why Enterprise IoT adoption is still Dawdling? As IoT continues to expand in size and influence with eye-popping estimates on number of devices connected, the whole world had already fallen for the hype. Many businesses regardless of their focus, seek to harness its potential to innovate, boost revenue and grab maximum market. While companies are expecting big things from IoT and are embarking on IoT initiatives, there are some major implementation challenges that are usually overlooked. As a result, most IoT projects terribly fail to satisfy customer’s requirement during deployment. IoT deployment is not so easy as it is imagined. Data privacy & security concerns, high cost of implementation, inadequate infrastructure, lack of skilled manpower, lack of standards, interoperability issues etc. 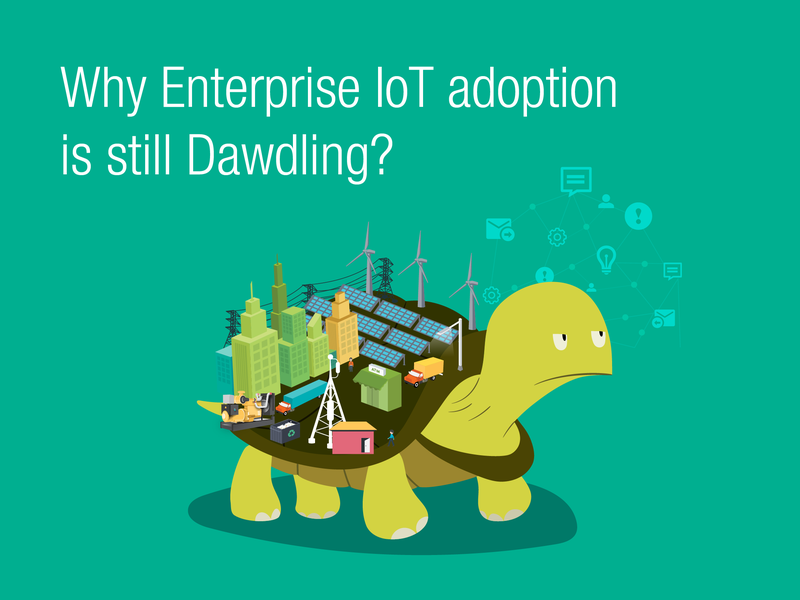 are some of the known reasons for IoT adoption to be sluggish. There are few unnoticed barriers which when addressed can result in faster and successful IoT adoption coupled with lasting outcomes for enterprises. A plethora of sensor data that includes metrics & measures, diagnostics and transactions creates a challenge on how these data can be brought together to add value. It is an obstacle that involves data integration, storage, processing and security. Here Edge processing comes in to play, where the data that falls within valid limits might be ignored or routed to lower-cost storage, while that which falls outside the norm could trigger an alert and be pushed to platform for further analysis. Edge processing for different sensor protocol is an unsolved problem today as either the hardware provider or the IoT implementer has to take the responsibility of data acquisition and build their own agent. Platform providers are ready to do reporting & analytics once the data is pushed and that makes no sense when it comes to end-end IoT. Solving this issue will make IoT application development & deployment easier. All you need is a state of the art gateway agent which allows preprocessing or filtering of the data closer to its source using rich set of protocols and apply suitable algorithms to check the extreme scenarios. In addition, it should also be able to manipulate the data, which is perspicuous by application server and then stream it, rather than having it all streamed back to the data center. We often see platform/software vendors showing fancy demos with colourful widgets, graphs and creative UI visualizations to customers. It is important to solve a business problem end to end, show clear impact & tangible ROI for end customer to be successful in IoT rather than just showing fancy demos. Companies must perform groundwork activities in pursuit of understanding the challenges faced by customers to create value add. There are very few IoT platforms, which is designed to easily build/customize end-end solutions that addresses serious issues faced by customers. To put it across, an IoT OEM (sensor and gateway manufacturers) can collaborate much closer with software vendors (IoT platform providers) and use the software to their advantage rather than building one by themselves. This may greatly influence the perceived investment of time and manpower for IoT adoption. This model has been well established by Telecom industry over the years. Even in the Banking domain, the current trend is Banks partnering with Fintech software companies. This kind of strategic alliance will allow quicker time to market, easy implementation & smooth operation with optimal support. The convergence will also aid in customer satisfaction. How? Generally, OEM’s will either provide a provision for the end user to build an application or provide a customized solution, which is compatible only with their hardware. As a result, an end user who wants to monitor ‘multi-vendor OEM devices’ spread across diverse locations will face challenges in data acquisition and interpretation. An IOT platform with rich set of technical expertise that possesses immense compatibility to multi-vendor IoT devices can be the only panacea.